Headlights are required, and modulating headlights are permitted. Unless your bike has a windscreen, eye protection of some sort is required. Handlebars cannot be higher than the height of the driver when seated on the motorcycle. There are no specific restrictions on helmet speakers, however be sure to exercise good judgment and caution concerning them. 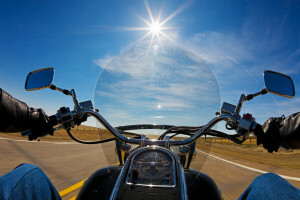 The absolute maximum sound level for your bike is 106dBA (note: measured twenty inches from the exhaust pipe at an angle of forty-five degrees). Mufflers are required, and cut-outs are not permitted. Motorcycles are permitted to ride alongside each other in a single lane, so that is good news if you’re traveling with a friend. There is not a restriction on the age of your passenger, but passenger footrests and passenger seats are requisite. Mopeds are not covered under state Lemon Law protections. However, all other bikes are. Intermittent safety inspections are required as well. Joke: What do you call a cyclist who doesn’t wear a helmet? An organ donor. Wear a Helmet! Safety helmets and eye protection are only required by law if you are under 18. But please exercise caution and utilize them anyway. Headlights and taillights are not optional after sunset. The above regulations should help you avoid unnecessary fees and legal troubles while riding in New Hampshire. Read on for some general motorcycle tips. To avoid a motorcycle accident, make yourself visible to other drivers. There is a good chance that they might not notice you otherwise. Wear noticeable clothing, preferably of the reflective kind. Ensure that you are comfortable in your motorcycle. Is your seat too high? Too low? On longer trips your seat and riding posture may be uncomfortable and give you severe back pain. Or maybe your handlebars are too far forward, and you have to lean excessively. Whatever the case, find what’s causing you discomfort on your bike and get it fixed. When you are riding, comfort could make a world of difference in the things you notice. Rather than thinking about that pain in your shoulder, you could be noticing the driver driving erratically behind you. Drunk driving is never an option. Studies have shown repeatedly that motorcycle drivers who drive while intoxicated are far more likely to be involved in fatal crashes than are drunk automobile drivers, simply because a motorcycle affords less protection to the rider than a car. If you are going to be drinking, know your limits. Even if you think you are fine, park your bike and ride back with a friend. Sometimes, despite your best efforts, accidents do happen. And when they do, you need the best representation you can find. Invest in a top notch motorcycle accident lawyer. Knowing that you have a skilled professional on your side can lift a world of worry from your shoulders, and allow you to focus fully on recovery.